If you are looking for a magic elixir to successful cruising, it will not be found in the marine hardware catalogs or boat shows. It will not come with state of the art electronics, or a different boat. It is much simpler than that. Of all the things you can do to enhance your cruising experience and safety, having a basic understanding of on board weather forecasting is the most important. The cost is minimal – except for some time – and the rewards huge. These benefits accrue at sea and at anchor alike. Although modern forecasting tools are wonderful, they only take you so far. And the models do miss occasionally. You may think a professional weather router will save you this trouble. But communications can break down at the wrong time, and weather routers make mistakes, even the best of them. They are relying on model data as well as instinct. Modern weather models do a great job of forecasting energy flows on a macro basis, but they are less successful in frontal zones and in mid-ocean on a micro basis – in other words, in your immediate vicinity. Of course, it is exactly the fronts, lows and convergence zones that we want to know about. Having been desk bound for the past year and a half, we’ve not had much need to think about this subject. But Peter Watson and crew aboard FPB 64 Grey Wolf have embarked on a journey that will require significant weather skills – both on board and from shore bound routers – and this has brought the subject to the fore. 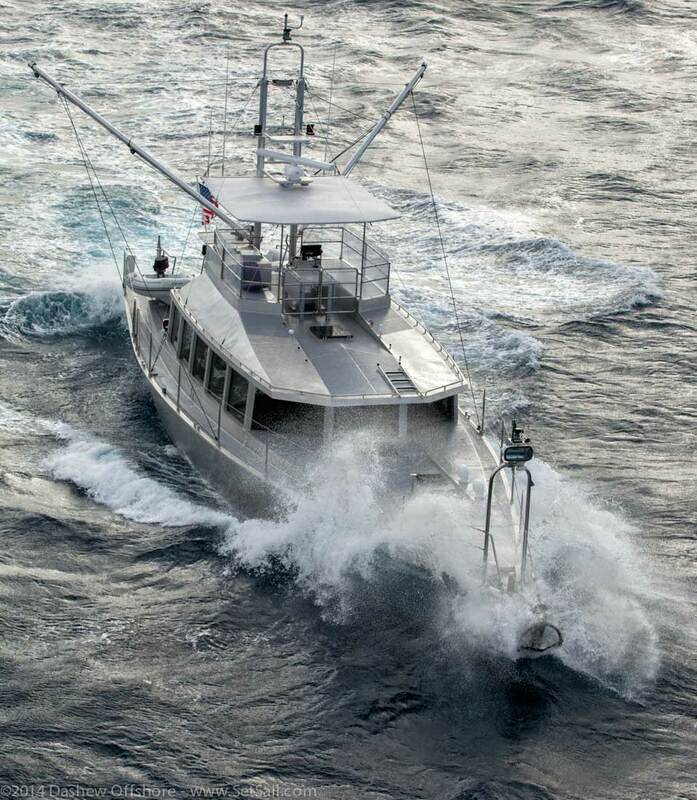 Above, FPB 64 Avatar during sea trials in gale force conditions, with the wind against tide stacking up the seas. We made the trip from New Zealand to French Polynesia in 1988 with Sundeer, again in 1997 with Beowulf, and in 2005 to California via Hawaii with the FPB prototype Wind Horse. The 1988 trip was just ahead of cyclone Bola’s visit to North New Zealand, and we arrived in Tahiti on the heels of a small but intense tropical system. So we can relate to what Peter and crew are thinking just now. The 1997 trip was easier, but we did have the pleasure of a strong compression gale one evening, with the breeze building to the mid 50-knot range. The 2005 trip with Wind Horse was a piece of cake. On Grey Wolf’s first leg, 2200 nautical miles to Tahiti, she has been hit with a bit of a blow – unforecast of course. There was a force eight gale along with six to eight meter (20 to 26 foot) seas, and then the tropical squall/storm shown above, in which they recorded 54 knots of wind. 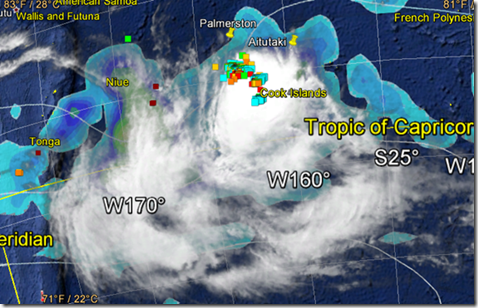 Grey Wolf was located in the strongest part of this tropical vortex in the vicinity of the Cook Islands. In the dramatic water vapor movie of this same event shown above, Grey Wolf is positioned roughly on the 160 degree longitude line and 25 degree latitude line, under the most intense activity. Although Grey Wolf was using two different weather services, nobody caught this event in their forecast. For Peter Watson and crew, it was no big deal, even with 54 knots of breeze. In a less well-found vessel, the situation might have been otherwise. Understanding the basics of weather forecasting and logging wind direction, velocity, and barometric pressure, you have a much better chance of figuring out what is going on weather-wise in your neighborhood, and what to do about it, rather than just relying on weather faxes or GRIB files. This is especially important in the tropics, where the model projections are less precise and more prone to error. Then there are risk scenarios to be weighed before departing. The weather forecast services constantly evaluate what their models are telling them. They use numerous weather models, from which they synthesize a forecast. One model may show a gale in three days, another a storm force condition, while three others show a stiff breeze. The forecaster has a conundrum. If he over-forecasts, says there is a storm coming, and then nothing happens, he takes heat. Plus his perspective is different than yours. If you are sitting in Las Palmas in the Canary Islands, or Norfolk Virginia, ready to head to the tropics, and someone says there’s a 5% chance – one in 20 – of a strong gale or storm force winds, do you depart, or wait a couple of days and see what happens? By understanding the basics, in particular the warning signs at the 500mb level, you can see these risk factors, quantify them for yourself, and then make an informed decision on whether or not to go. You are in a better position to discuss the conditions and forecast scenarios with the professionals, rather than just accepting what is being said – and hoping for the best. This photograph of the catamaran Ramtha was taken during a rescue operation at the height of the Queen’s Birthday Storm in 1994. This event was a tragic example of what we are talking about. There were low probability indicators several days in advance that this blow could occur. When they first appeared, these were ignored by the forecasters and yachts in the vicinity. As the storm developed, problems were compounded by bad tactical advice given on the SSB Radio net. Had the yachts in the storm’s easterly quadrant moved a bit west, rather than just staying put and hanging on, they would have been much better off. Which brings us to part two of this post: heavy weather tactics. The most important tactic is avoiding heavy weather in the first place. 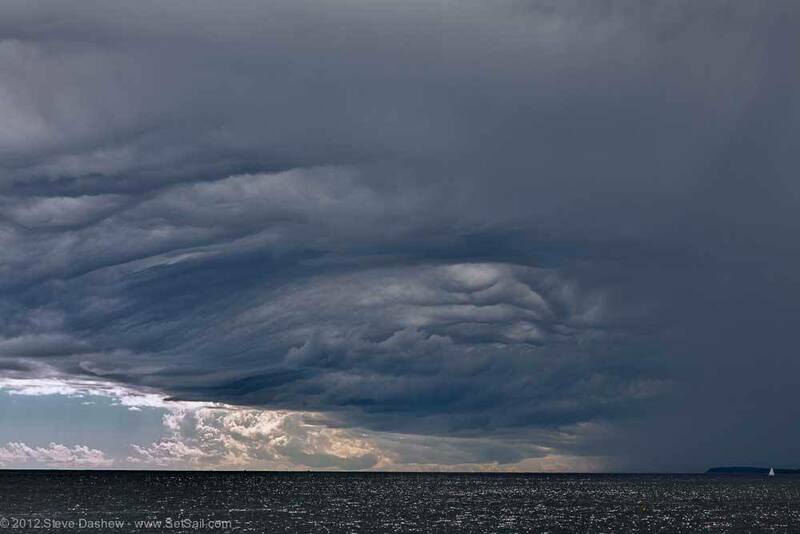 But if you spend enough time at sea, occasionally you are going to feel Poseidon’s wrath, in which case understanding the structure of the pressure flow that is causing your grief becomes critical. Here is an extreme example of what is possible. The photo above was taken from a helicopter during the 1998 Sydney Hobart Race The crested wave we are looking at is in the range of 80 feet. If you are under that crest, there is little that can be done. But if you are using active storm tactics, as opposed to passive, you can survive. In these conditions, the 31-foot light displacement sloop Bin Rouge made it through, where other larger, more “seaworthy” yachts were lost. The success of Bin Rouge was the result of sailing upwind as opposed to running with the storm, and reaching across the breaking wave faces towards the more easily negotiated passes between crests. 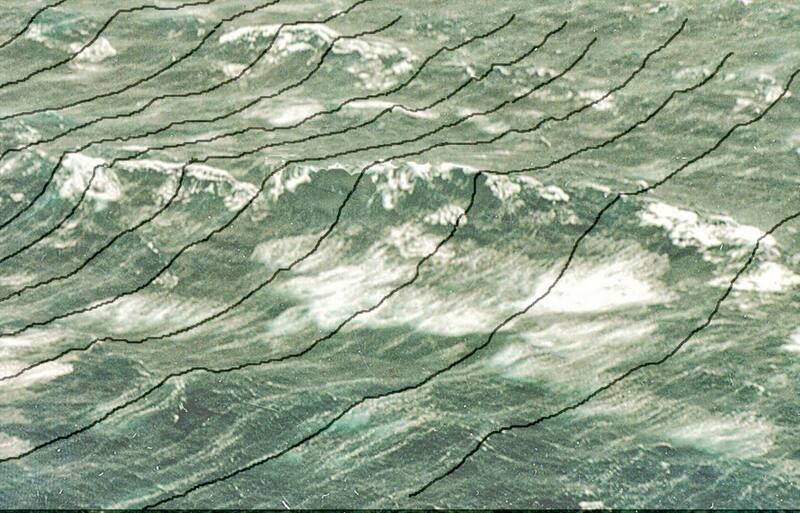 Often moving a moderate distance in the correct direction can make a huge difference in the wind and seas encountered. This is particularly important with tropical storms, where as little as 30 miles can mean the difference between a moderate gale and hurricane strength wind. Once you understand the dynamics of pressure flow, you will have more tools at hand. In terms of both avoiding heavy weather and having the best tactical options, boat speed, steering control, and vessel reliability are paramount. Small problems have a habit of cascading into serious issues in difficult weather. Two of our books, Mariner’s Weather Handbook and Surviving the Storm, came about because of questions we were asked in almost every anchorage we visited in the 1990s. Cruisers who had made it from Europe to the tropical South Pacific were worried about what was to come. The guys would be talking to Steve and the gals to Linda, each group with their private concerns. Since weather and storm tactics were at the core of the way we looked at almost every aspect of cruising (as it was with most of our experienced cruising buddies), this came as quite a surprise. The lack of understanding of these subjects, and the reliance on group opinion as opposed to thinking things out for oneself, provided the catalyst for us to get to work on something that might help. Dashew Offshore, Beowulf Publishing, and the FPB team have been blessed with the support of the cruising community for many years, and we’d like to return the favor in a small way. We are making these two books, Mariner’s Weather Handbook and Surviving the Storm, available for free as PDF files. We hope Mariner’s Weather Handbook helps you avoid the need for Surviving the Storm. If these books help a few of our fellow cruisers have a more enjoyable experience, and perhaps stay out of difficulty, we will have been amply repaid. Simply click on the links below to download these publications. We’ll see you out there cruising in 2016. This entry was posted on Monday, March 31st, 2014 at 4:48 am and is filed under Cruiser's Tech Talk. Both comments and pings are currently closed. Hello, and thank you. I’ve made your books available to the readers of my blog. Lots of interest, which is no surprise. Great stuff. Excellent information from an entirely credible source – thanks for making it available! Hi Steve & Linda….A BIG THANK YOU for the .pdf books.! The biggest problem with your books is.. KEEPING THEM.! I’ve bought and read them all starting in the early 80’s. I always took great care in keeping track of them …as part of the boats important documents, books & papers.! But when my daughter and her (green) boyfriend set out on a two year cruise, long on excitement but short on weather knowledge, well I just had to give them these two books. So… Thank you again for the downloads…AND all the great wisdom from your website.! Very generous…I’ve admired these volumes from afar for some time. Thanks and I’m linking your site to my list of “Useful” sites on my boat restoration blog. Not that you need further publicity! Excellent, thanks for making these available! We have these bound books, now thanks to you we have them on the iPad. Just saw on the National Weather Service they’ve posted an El-Nino / ENSO ‘watch’ alert for the northern hemisphere. With our planned eastward Atlantic crossing this June we’re actively studying everything we can. Thank you, I love it! Perfect format for easy research and review. Best of all, I can afford this!!! Thank You! Steve and Linda, thank you for this treasure of information. Safe travels to you!!! As a returning sailor and recently graduated deckhand; information like this to further develop my skills is rare. Thank you for your generosity. It has been immensely interesting reading about this breed of MY, time to see if any are about Auckland, NZ! Thank you so much for making these treasure-troves available as free PDF downloads… they are truly priceless! I have these in Hardback . . . and now on a ThumbDrive . . . THANK YOU for making these available !!! I have been carrying and reading your books since the 90s. They are not light but very good! Now they weigh nothing on the boat….Thank you much!!!!! Hi Steve, Linda, and the rest of the Setsail-crew! Thanks for the fantastic e-books!